With Chiron in your sign, you’re learning to live more authentically, dear Aries, and today’s Mars-Chiron aspect is particularly potent and empowering. Mars is your ruler, after all, and Chiron is in Aries. You’re likely to feel in sync with people around you and with your environment, and you’re displaying quiet confidence that endears others to you. You feel pleasantly effective, competent, and ambitious. Stay active and involved now for best results. However, a Mercury-Neptune aspect today suggests seeing things through the lens of wishful thinking. Shortcuts taken now can be regrettable and possibly costly at a later date. Conversations can be vague or even guilt-ridden. Precise and factual reasoning can suffer today. Your mind is likely to wander, although it is imaginative and given the right place for your musings, you may very well come up with creative solutions to problems. If you can find healthy ways to get away or mix up the routine, do so. You’re turning into subtly or otherworldly levels now, dear Taurus, on this dreamy day. Even so, you’re inclined to take action if it means supporting or helping someone out. You can be a source of great comfort or inspiration to a person. Creative and artistic matters are favored today, as is any volunteer work. An opposition between Mercury and Neptune can point to a need to pull back from overthinking things, but it can also confuse matters, so try not to bank on what you see today. Do your best to avoid misunderstandings and double check your facts. It’s also a good idea to seek out harmless ways to engage your imagination and need for drama in your life. Watch that you don’t get carried away by an idea or vision that takes you too far away from what needs to get done, but do find ways to satisfy your itch for new options and possibilities when it’s appropriate to do so. Interactions with others go over well today, dear Gemini, as you’re willing to learn, and you’re open to sharing your ideas with others enthusiastically. Your thoughts can also turn to expanding your mind and experience through travel and adventure or some form of higher learning. Nevertheless, something you say or do today could be relayed or interpreted in the wrong way, with your ruler, Mercury, in opposition to illusory Neptune. Even so, this can also be a day when all that is imaginative, fantastic, or spiritual engages you. Seek out people you trust for opinions on your more practical affairs, but look within for answers to matters of the heart. You may feel that you have too many choices right now, and it’s likely that you’re not truly ready to come to a solid conclusion. If that’s the case, then wait things out. Uncertainty about your career or goals can interfere with the enjoyment of the moment. Take the time to reflect. This can be a time when you learn something valuable about a partner or your deeper desires, dear Cancer, with heaps of self-honesty. You are fearless about facing feelings. Something may touch you or inspire you now through your interactions with others. However, as the day progresses, your imagination may be working overtime. Mercury and Neptune form an opposition, and this can make it hard to concentrate when you need to most, disrupting your routines. You can have a hard time arriving at definites and conclusions. Let your imagination go, but do so in the right places, and not so far that you set yourself up for a letdown. The desire, on one hand, is to obtain information and make sense of something, but on the other, the tendency to break it apart is powerful. This is not the time for critical detail work or beginning entirely new ventures. This is a good time for putting the outworn elements behind you so that you can make space for the new, dear Leo. Interactions with a partner can be intense and revealing. 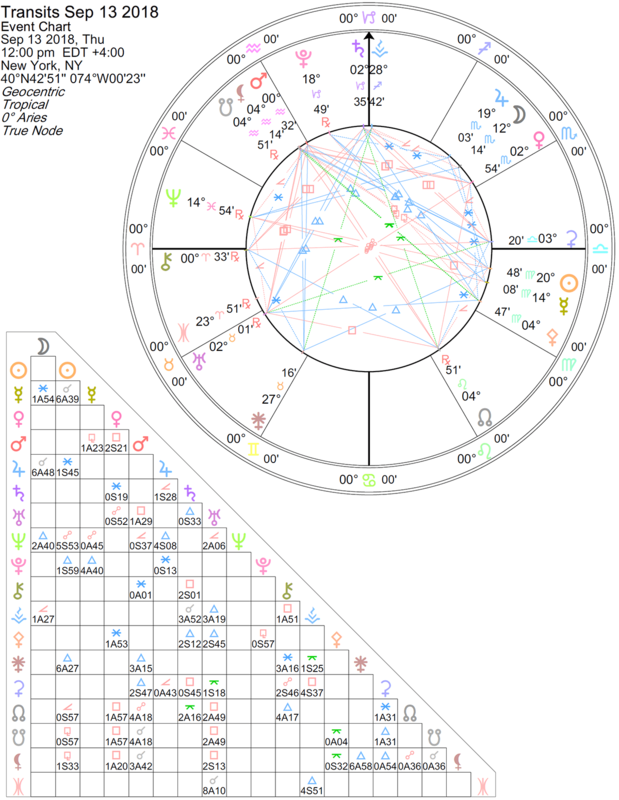 A Mercury-Neptune opposition can introduce some confusing elements to the day, however. As much as you’d like to be gung-ho, you may end up on the fence. Be especially vigilant when it comes to lending and spending today. New ideas can be imaginative but may need more attention to detail before passing the test. This is a time for checking and double-checking your work if you’re dealing with facts and figures. It’s important to avoid over-committing now, and this applies to your spending, relationships, friendships, and with regards to work and obligations. Work matters can be revving up and highly motivating, dear Virgo, and you might learn of a new health or wellness program that you are excited to apply to your life. Physical activities can be healing. Also today, though, Mercury in your sign reaches an opposition with Neptune, and there could be some drama in your close relationships. You might be frustrated with others who can seem to be unresponsive, indifferent, imprecise, or extremely vague. Situations are ambiguous when you’re seeking definite answers. You might also question whether you’re being lied to today. Try to let things be and depend on yourself just for the time being. Watch also that you don’t say something that leaves too much open to interpretation, as people may not be getting it. New insights can be intensely revealing today, dear Libra, mainly about love and intimacy. While it’s not a time for pushing hard, it’s a good time to gently push boundaries or cross the usual thresholds, as you can make great strides with honesty and respect. Conversations with a loved one can be powerful today, but as the day progresses, we head into a Mercury-Neptune opposition which can cloud things. It can be difficult to distinguish between what we want to believe and what’s real. This aspect reminds us that we can’t always have clear answers — and don’t always need them! A chaotic or disrupted routine or lack of directions can be distracting today, but the detour your mind takes as a result of this can be enlightening, ultimately. Watch for miscommunication. Discretion may be in order today. You can be tempted to push beyond the usual barriers and get to the heart of a matter today, dear Scorpio, and this can help you solve a problem or understand a situation. Complicated issues seem to make more sense when you allow your intuition to work for you. Relationships, although a little competitive, can be dynamic and exciting now. Conversations about, with, or on behalf of family can be intense and revealing. However, an opposition between Mercury and Neptune today can challenge your thinking. Perhaps it can open your mind to see new options and possibilities, but it can be disruptive as well, and misunderstandings are possible, particularly with friends and lovers. There can be trouble with people overstepping their boundaries, promising more than they can deliver, or with missed connections and general lousy timing. Rest and reflect! You are coming across loud and clear in the first half of the day, dear Sagittarius, and others tend to follow your lead. Your words and actions can be helpful and perhaps healing, too. Love and attraction are strong notes in your life right now. Your powers of attraction run high, and there is a sense of moving forward. You are facing challenges head-on and determined to resolve problems, but as the day advances, it becomes more challenging to deal with things clearly and directly. Mercury opposes Neptune, and it’s essential to avoid making important decisions based on your current perceptions as wishful thinking can influence what you see. Others may not be telling you all you need to know now, or they could be misinformed. Dreaming up new possibilities can figure strongly, but it’s not the time to commit to something substantial. You could be taking action on a financial, family, or security matter that puts you in a better place emotionally today, dear Capricorn, and this is satisfying. Family and friends seem to be showing you the way towards positive change. Be as open as possible to learn from others. As the day advances, though, keep your wits about you. There is a tendency to gloss over facts, and it’s doubtful that you’ll get useful information or straight answers from others. If you can keep things creative and free-form, then you can enjoy the exercise of opening your mind to new possibilities. You could be hungry for entertaining and enlightening concepts, ideas, and fantasies. In the right places, these can be rewarding. With Mars back in your sign and direct, dear Aquarius, you’re regaining your energy, confidence, and courage. You are pursuing your desires and pushing personal plans forward, and today, you have a distinctive edge along these lines. Your magnetism heightens, and you might choose to use this time for expressing yourself creatively and persuasively. You are putting fears behind you now. You might also enjoy coming to someone’s aid, or taking the lead on a project. 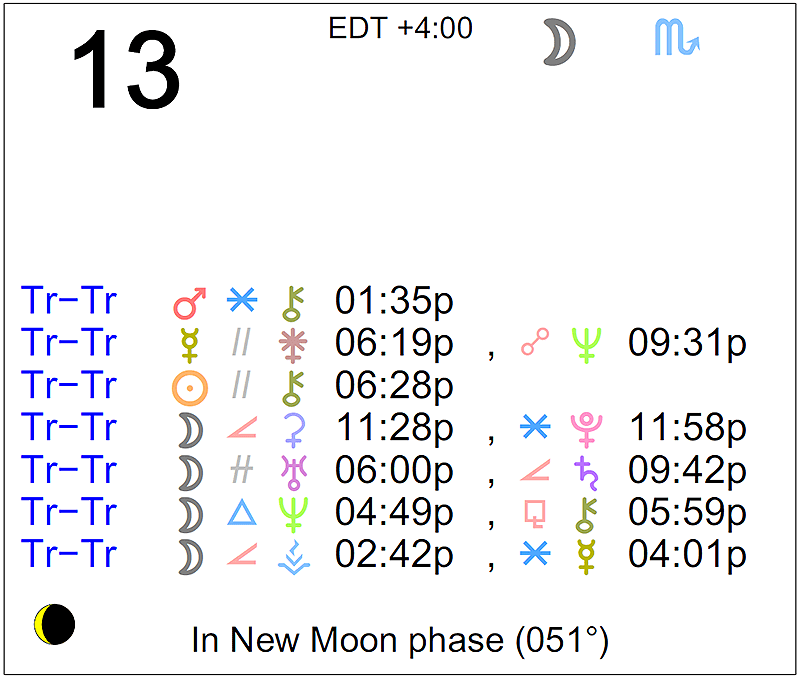 While you can be excited about bringing more order, structure, or knowledge to a project or endeavor, with Mercury opposite Neptune later today, you may not have all the facts or information to go on. Uncertainty about your income, resources, or abilities can weigh on your mind or distract you from doing what you want to do. You may only need to take a step back and allow your intuition to kick in before you move forward. People and information can be elusive now. 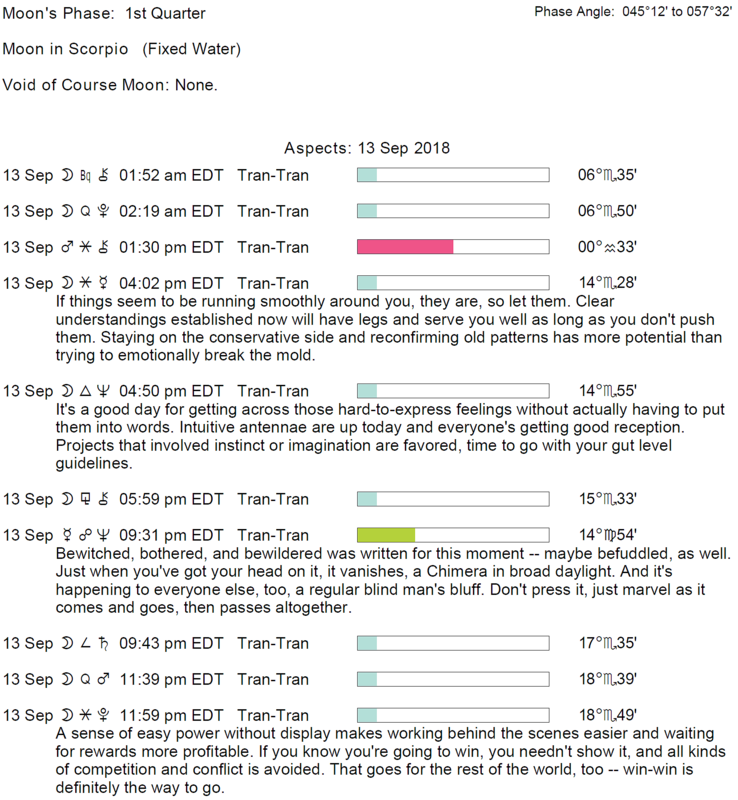 Mars, the planet of action, is in the sign just behind yours, dear Pisces, and thus in your soul and privacy sector, and this points to the need to take things easy. Mars forms a creative aspect with Chiron today, encouraging activities that ground you and help you heal. Allow yourself to relax and let go of such limiting states of mind as guilt and worry. It’s certainly a time to be spontaneous and to allow a more creative side of your personality a chance to shine. However, later today, Mercury opposes Neptune in your sign, and questions from others could awaken the escapist in you. While you do need to take some time to get to conclusions, consider whether you can give a little and give others something to go on. You might experience a mental disconnect with someone now. While it’s too easy to become distracted today, it’s also a strong time for new ideas and imaginative thinking. Given some space and freedom, you can come up with something very innovative. Above are astrological event highlights for the day. Full Horoscopes are at Cafe Astrology. If Your Birthday is September 13th, If Today is Your Birthday full horoscope here. Moon 13° Scorpio 13' 51"